Don't Like It Here? Find Another Universe : Krulwich Wonders... The Noble-Prize winning physicist Richard Feynman encouraged scientists and layman alike to embrace the chaos of nature. 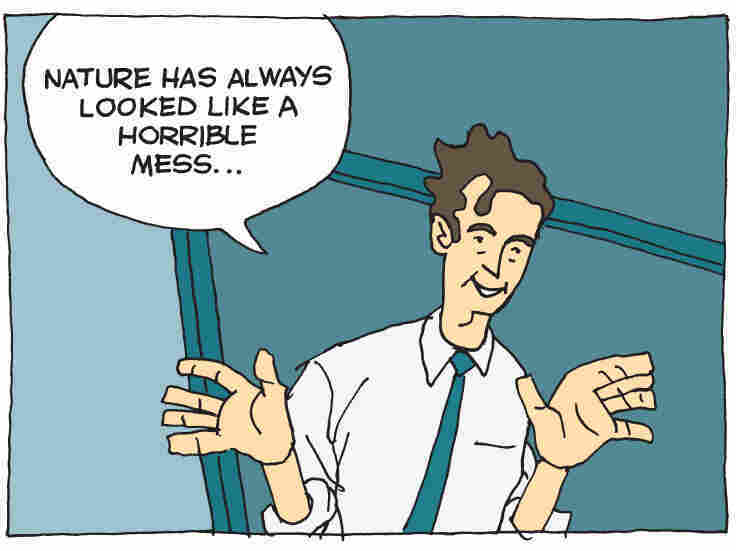 A new cartoon biography expresses his message in vivid color. We think great scientists know so much, but really, they know very little. "Science," said the physicist Richard Feynman, "is the belief in the ignorance of experts." 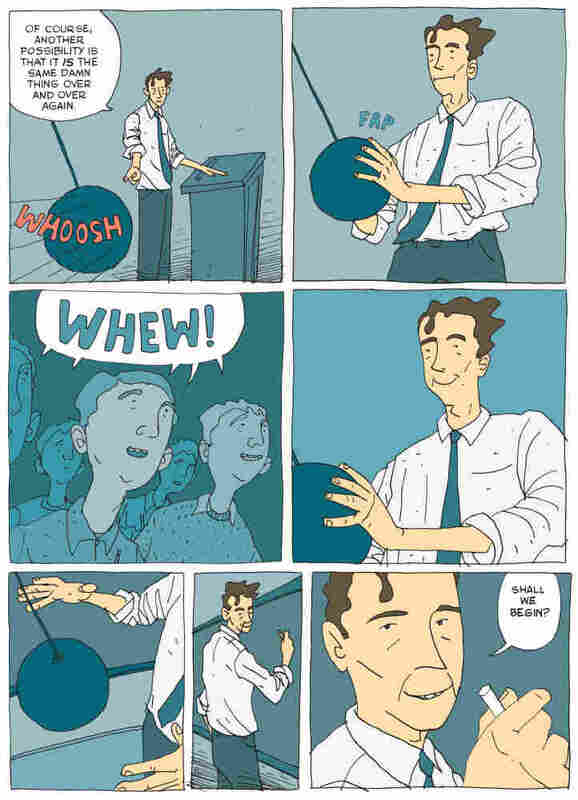 Jim Ottaviani and Leland Myrick have produced a book-length cartoon biography of the American physicist Richard Feynman, who helped develop the atomic bomb, pioneered work in quantum mechanics and famously helped investigate the Challenger disaster in 1986. 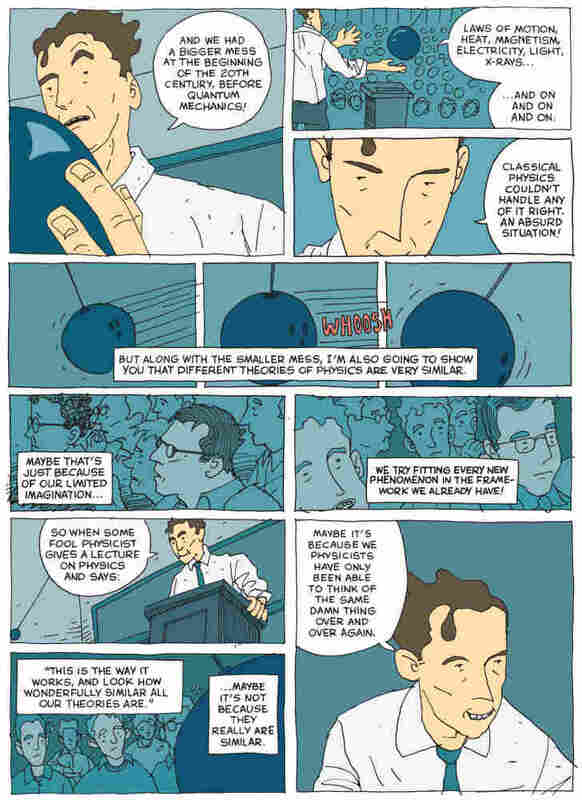 Feynman was also an eloquent science teacher, who often confessed to his audiences how hard it is for scientists to make sense of the world, because so often what scientists learn defies common sense. Look out the window. The yard or street in front of you is there, just where you left it yesterday, yet the sun keeps changing position, rising from the east, traveling, setting, so it looks like we're on solid ground and the sun is in motion. That's how it looks, but that's not how it is. Copernicus discovered that what's really going on is the Earth is constantly moving, spinning like a top around the sun, and the sun is, relatively, still. Sensually, this makes no sense. As the writer Ed Dolnick says, "If Copernicus was right, the Earth was speeding along a gigantic racetrack at tens of thousands of miles and hour, and none of the passengers suffered so much as a mussed hair." How can we know we're moving when we don't feel it, at all? Our minds have to instruct our senses. And that's hard. It's still hard. Four hundred years after Copernicus, in Feynman's time, we are still trying to make sense of what we see. How does order and predictability emerge in a subatomic world where dizzy little particles are behaving so strangely? One moment they are particles, then they are waves. Try to locate an electron? You can't. It might even be everywhere at the same time. Feynman told his audiences that even though the subatomic world looks so messy, so unintelligible, bit by bit, we are learning some of its secrets. They don't add up yet. The rules Feynman and others discovered don't even work all of the time, the parts don't coordinate, but scientists learn to stay humble, roll with new information, we will learn more. The key, he says in a lecture that Ottaviani and Myrick use as a prologue, is accept the universe as it is. We must instruct our minds to live with the facts we discover. The facts don't make sense at first. They may never make sense, but hey, this is our universe. We're stuck with it. We don't have another one, not yet. So the best we can do is try to fit our minds to universe we find. Every new science experiment is, in its way, a beginning. Jim Ottaviani wrote it. Leland Myrick drew it. Hilary Sycamore colored it. The book is called Feynman (First Second, 2011). There's another new Feynman biography just out, from Lawrence Krauss, called Quantum Man (W.W. Norton, 2011). I haven't read it, but Krauss is a fluent, colorful writer and a fine physicist. 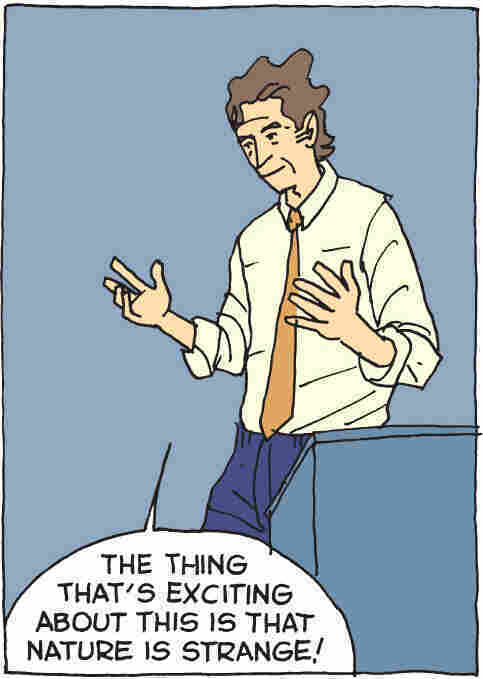 The quote from Ed Dolnick comes from his delightful The Clockwork Universe (HarperCollins 2011) and if you want to see Feynman being Feynman, there's always the classic bongo video of him riffing on the word "orange juice." Oh yeah.